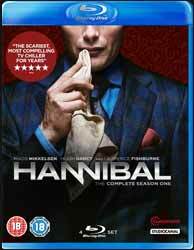 The first season of Hannibal consists of 13, 45-minute episodes. This is an incredibly dark show which explores the early relationship between psychiatrist Hannibal Lecter and his patient, gifted FBI criminal profiler Will Graham. While this is an exceptional strong series, fans of Thomas Harris's original book series and the movies that feature Hannibal Lecter will get so much more out of it. Will Graham, played in the show by Hugh Dancy, is the central character of the novel Red Dragon. In the movie Manhunter he is played by William Peterson and by Edward Norton in Red Dragon. Here we see him as a fragile young man. He is capable of empathising with killers; of being able to extrapolate the evidence from the crime scene and then relive the killer's actions. Graham is a dark individual with a fragile state of mind. At the start of the series he is a lecturer. It is the appearance of Jack Crawford (Laurence Fishburne), who wants to borrow Graham's unique "gift" in order to track down a serial killer who has been praying on teenage girls, that drags Graham into working with the FBI. Mads Mikkelsen is incredibly creepy as Lecter, but this isn't the first time he's played a butcher who feeds his human victims to unsuspecting people - Green Butchers (De Grønne Slagtere) saw him play a butcher who killed people and then sold them on as a delicacy called Chicky-Wickies. Gina Torres (Firefly) appears in a handful of episodes as Bella Crawford, Jack Crawford's wife. Other notable guest stars include Ellen Greene, Gillian Anderson, Eddie Izzard and Lance Henriksen. And quite a number of the show's guest stars have previously worked with creator Bryan Fuller in earlier TV shows These including Caroline Dhavernas, who played the lead role in Wonderfalls and Ellen Muth, who starred in Dead Like Me, guest-stars as Georgia, who thinks she is dead - much like her character of George Lass who dies and becomes a Grim Reaper in Dead Like Me. Extras are a little lacking. All we get are First Look (3 min, 44 sec) and Forensics 101 (3 min, 09 sec look at the forensic team - all of whom appear in the books). I don't know how the original discs will be packaged, but we received them spread over four Blu-ray discs. It seems a bit odd, as the content would easily fit on a single disc - but at a push the most it would need is two. This is a strong series which will appeal to both fans of Harris's work as well as those who know nothing other than Lecter is a serial killer and cannibal. The season ends on an impressive cliff-hanger, but thankfully a second season has already been green-lit.